Arab Media & Society has published two of my articles. 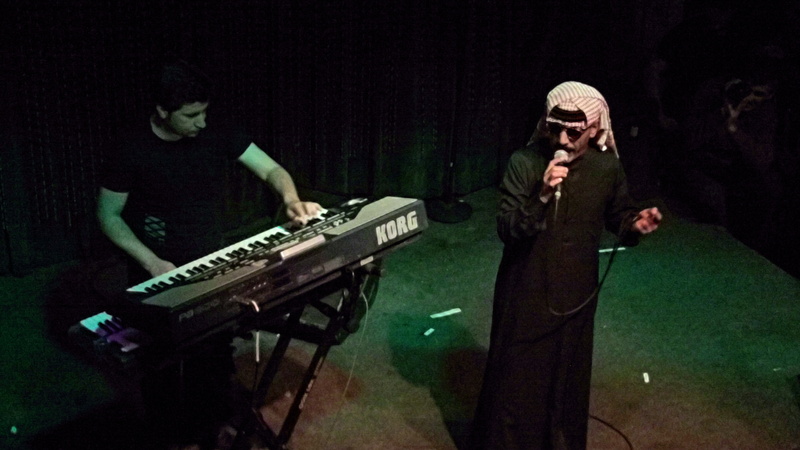 The first is an account of the November Omar Souleyman show in Philadephia where I interviewed Souleyman and critqued his portrayal in Western media outlets. The second is a content analysis of the Syrian privately-owned newspaper of al-Watan focusing on how the paper portrays economic “development” by walking the fine line between the social-market and free market economies. Souleyman and his keyboard-synth player Rizan Sa’id received a rowdy welcome from the crowd who remained enthusiastic throughout – upon any sign of stillness in the audience Souleyman would wave his hands, prompting fervent dancing and cheering. This two-man show, a mix of Souleyman’s vocals and Sa’id’s skillful electronic maneuvering, stood in for a performance that is normally accompanied by more than five musicians. Instead, Sa’id simulated many of the instruments on his keyboard producing the so-called “Arab new wave” sound described by some Western reviewers. Yet a few years ago, before Souleyman’s gradual emergence on the indie music scene and before Bjork would recommend his album on NPRii and before Damon Albarn of the Gorillaz would express interest in collaboration, his dabke sound existed in an entirely different context that was (and still is) far removed from your average Western music listener. Gergis, an Iraqi-American musicianiii with a keen ear, has been traveling to Syria for over a decade and paints a colorful portrait of Damascus’s urban soundscape in 1997 when he first heard Souleyman’s music. “Back in those days,” he said, “There were myriad cassette tape stalls dotting the streets of Damascus. You would think there must have been a noise ordinance passed since that time, because since the year 2000 nothing has quite matched the resulting cacophony . . . where stalls would line up or be back to back blaring their wares at deafening volumes. Gergis’s mass of recordings of the Syrian street and radio broadcasts, including music from Souleyman and Assyrian musician Jermain Tamraz, were released by the Sublime Frequencies record label on the eclectic album I Remember Syria. Years later, still struck by Souleyman’s sound, Gergis suggested that Sublime Frequencies release a compilation album of all the Souleyman tracks that he collected during his time in Syria. Now in 2010, Souleyman is on his second tour of the United States and has released three albums through Sublime Frequencies. It is possible Souleyman is the first Syrian dabke artist to follow this path to notoriety in the West. Yet to many Western journalists and observers, the combination of checkered kuffiyeh and jalabiya is too tempting of an image to ignore, if not outright fetishize. The blurb on Johnny Brenda’s website advertising his Philadelphia show remarked, “Mustachioed and kaffiyeh-bedecked, with eyes obscured by dark glasses, Omar Souleyman, 41, scarcely looks the part of an international pop phenomenon,” while the Guardian’s reviewiv of a 2009 concert brought with it the unfortunate headline “An Arabian night to remember”. Media representations of Arabs – from film to print to text – have a disparaging, if not outright damaging, history in the United States and the West. While some may remark that mere descriptions of Souleyman are just that – descriptions, then they would be missing out on the key fact that Souleyman is not an active participant in this system of media representation. Instead he is on the receiving end of numerous stereotypes and assumptions both about Syria and dabke music. Parallel to the outlandish music reviews, which Gergis himself laments, is another layer of media coverage and discourse rooted in the language of authenticity and class. It is no surprise that the New York Timesv is leading the way in attempts to determine what forms of Syrian art are culturally legitimate enough to be appreciated by the West. To put this coverage in context, consider that Souleyman’s hometown of Hassekeh, with its majority Kurdish population, is closer geographically to the borders of Turkey and Iraq than Damascus. Far from the central metropolis, it is not a town many Syrians consider to be a hub of “high culture”, much less distinctive musical talent. Instead, Syrian cities such as Aleppo are praised as the heart of authentic Syrian musical traditions. The complexities of Syrian perceptions are being generalized here, but it suffices to say that Souleyman’s musical roots in the countryside put him on the fringes of a narrow and at times elitist definition of art, even though dabke is widely enjoyed throughout the country. With a November 3 article in the New York Times titled “Two Faces of Syria, Neither Promising for Artists”vi, the definition of respected art emanating from Syria is even further narrowed. Journalist Michael Kimmelman portrays Syrian amateur nouveau riche who are tricked into believing their boutique hotels and restaurants are fashionable excuses for “worldly culture” and are too busy basking in their new-found riches that they miss out on opportunities to push “cultural liberalization”. Yet even if there were a Syrian desire for “cultural liberalization”, he says, “Stagnant social politics in this part of the world tend to preclude much of an artistic life.” In this shallow treatment of Syrian creative life, Kimmelman reduces Syrian youth culture to “a culture of small-bore opportunism”, all the while attributing his views to Syrian “artists and intellectuals”. You are currently viewing the archives for December, 2010 at the news in arabic.